Are you serious about the industry and want to work behind a bar at a restaurant, nightclub, or hotel? At Raleigh Bartending School, our full 40 hour bartending certification course enables you to take your 2 certifications anywhere in the country and make handfuls of cash nightly! If you have ever wanted to be able to mix drinks like the professionals, this full 40-hour certification course will teach you to make the most popular cocktails, martinis, and shooters requested in bars today. You learn from an industry leading Mixologist, in a real working bar environment with the professional tools and equipment. No kitchen sink and 2-liter coke bottles here! This training is exclusive to Raleigh’s Bartending School and is not offered by any other Bartender School. 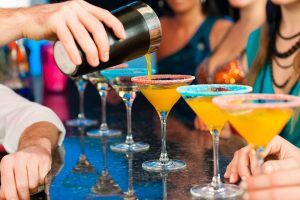 Upon bartending school graduation, you will have the knowledge and confidence necessary to make great drinks while having a fantastic time making money! Great for those who wish to gain employment in establishments such as Hotels, Banquet Halls, Golf Courses, restaurants, nightclubs, etc. CALL NOW – (919) 676-0774. I really enjoyed learning at RBS! Overall I really loved my time there and it was a great place to learn how to bartend properly. When I first got into the Bartending school I was not completely sure what I was getting myself into, but after spending one day there I realized that what I was doing and how much I was learning at such a quick pace was amazing. I completely enjoyed my time there and loved how much I was able to absorb on a daily basis. Vicki was very helpful whenever it was necessary and didn't let anybody fall behind. Overall I really loved my time there and it was a great place to learn how to bartend properly.